For authentic catering in Fairfax VA, Chutzpah stands out. With such a name, you would not be wrong to expect nothing but the best and that is exactly what you get from the moment you walk in. The restaurant, established to cater to people from all over the city and beyond, serves authentic New York dishes and has been delighting diners for over 10 years. 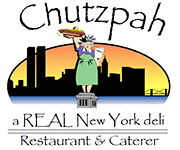 To deliver the ideal experience, Chutzpah serves unique overstuffed sandwiches, overflowing platters of goodness at unbelievable prices, and dessert options that you will love. Meals are prepared using only the freshest ingredients sourced from reputable suppliers in the city and the menu touches on every New York specialty. The staff at Chutzpah know just how to deliver the right touch as well as recommend the day’s specials in a witty manner. The catering service is flexible and inclusive of special occasions such as Shiva, Passover, Brit Shalom, and any other special day as per your requests. Celebratory menus are special and all inclusive with a staff determined to meet you all the way. We have a flexible cancellation period too in case something came up before the order is delivered. Our staff is made up of excellent communicators too. Whether you are placing an order for a one-off event or recurring events, we treat each order specially and will work with you to create the menu you prefer. Our informed staff will curate the perfect meal combos when you are not sure what goes with which occasion too. When you place an order, things are set on motion to fulfill it, starting with creating the complete menu and establishing delivery time. You will have someone reporting to you on a regular basis to be sure that things are proceeding as you would like. Because Chutzpah uses fresh ingredients for all its meals, you can expect nothing but the freshest and the best. None of that frozen stuff makes it to the table since the intention is to cook up a storm that create a lasting impression on your guests. Chutzpah knows that delicious meals are not enough if they are not filling. Our platters are overflowing and our sandwiches overstuffed. If you can believe it, our chicken soup is better than your grandma’s but our secret ingredient we will never tell. We cater to companies as well as families and so we have varied payment options for all. Cash, major credit cards, corporate and personal checks are all accepted here. We also have special arrangements with companies to make payments from corporate accounts. Our charges depend on the meal ordered and the number of people and we have flexible rates for large numbers. Chutzpah caters to all events – whether celebrated worldwide or not. We also offer special packages for entire meals, sides, or simple bitings. We have a strict order policy for 10 people and above, but we are flexible under special circumstance. For all your catering Fairfax VA needs, get in touch with us. Feels like an authentic NYC deli! Always the best. A taste of home. Real NY food. Great reuben. Large deli menu. Have Questions About Our Catering in Fairfax VA?